With faux leather armbands and dual chest pockets, the Embree Kids Parka combines refined styling with technical features. The outer layer of the goose down arctic jacket features a performance 10,000 mm water-resistant fabrication that's durable, water-repellent, lightweight and breathable. A layer of ﬂeece highlights various parts of the jacket ranging from the pocket liners to the neck trim, providing added comfort. Meanwhile, the inside of the jacket features a soft interior fabrication with the authentic Triple F.A.T. Goose printed lining pattern. We use premium 80/20 white goose down at a 600 fill power to provide superior quality, loft, and warmth for our arctic jackets. Air pockets formed by the down ﬁll retain heat, while allowing water vapor to be released outside the jacket. We only use the highest quality coyote fur from suppliers in Canada. Coyote fur doesn't freeze or absorb water and provides added warmth and comfort. Premium YKK Zippers are used throughout Triple F.A.T. Goose jackets. For years, YKK has been a trusted provider of quality zippers that are less prone to malfunctions than conventional zippers. Hidden thumbholes can be found on the storm cuffs, providing added warmth to your hands in frigid temperatures, while preventing wind chill from seeping in. The storm cuffs may be hidden in the jacket sleeve when not in use. The Embree winter parkas features fleece lined front bellow and hidden side pockets along with an inside chest pocket for convenient, additional storage. PREMIUM WHITE GOOSE DOWN - Triple F.A.T. Goose Girl's parkas are insulated with premium white goose down - one of the best and lightest insulators known to man, providing exceptional warmth and comfort. DETACHABLE REAL COYOTE FUR - A layer of luxurious, Canadian coyote fur lines the hood, providing protection to your face from wind chills. A hidden adjustable wire insert along the fur trim allows you to adjust and maintain the shape of the hood according to your preferences. 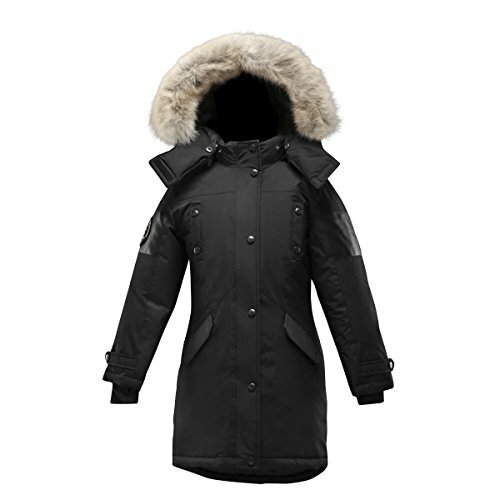 The fur is detachable from the hood and the hood is detachable from the arctic parka. SIZING AND FIT - FOR THE BEST POSSIBLE FIT, WE RECOMMEND ORDERING A SIZE UP. FEATURED IN: Triple FAT Goose has been featured in major publications including: Men's Fitness, New York Times, Time Out Magazine, Complex, NY Daily News, HypeBeast, Thrillist, SHEfinds, Outside, Men's Health, InStyle, etc. If you have any questions about this product by Triple F.A.T. Goose, contact us by completing and submitting the form below. If you are looking for a specif part number, please include it with your message.